Chileno Beach is probably the best all-around beach in Cabo San Lucas. 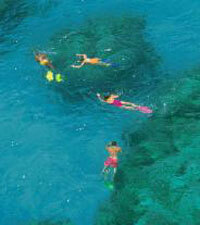 The reef offshore is also home to some of the Los Cabos area's best snorkeling. You can see sea turtles, manta rays, sea fans, and hundreds of tropical fish on this excellent snorkeling tour. Chileno bay is about a 30-minute boat ride from Cabo San Lucas. Chileno Bay is also a popular spot for many of our Boat Tours to go for snorkeling. Roundtrip Transportation to the snorkeling location, all taxes and fees, snorkeling equipment and bottled water. You will likely share the boat with scuba divers. You'll arrive at Chileno Bay and you'll snorkel on the beautiful reef while they make their first dive.